As is perhaps obvious by the fact that I'm posting my project in the afternoon of reveal day, rather than midnight the night before or early in the morning, the most challenging part of this project - the first real freeform peyote project I've ever done - was the (seemingly?!) prodigious amount of time that it took. Even now I feel like I could spend a lot more time on it. I was perhaps overambitious by doing a necklace rather than a bracelet, true. But, the reason I undertook this challenge was because of some beautiful borosilicate space pendants I've purchased from the talented Ian Graber. I have a vision of what the designs need to be, and at their core they're freeform. I can safely and happily tell you that I learned a tremendous amount from this project. 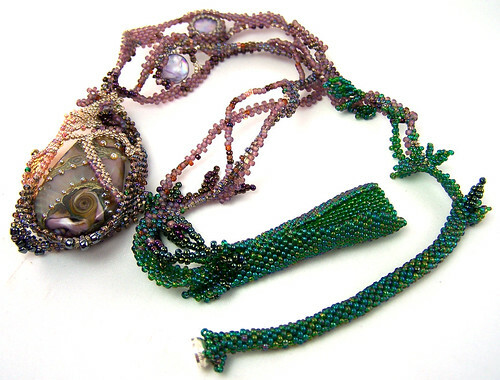 The necklace design started with the netting you see around the focal bead. Since I was just playing around with some extra beads as "practice," I thought I'd do a little bracelet before starting the "real" project. Just this small section taught me a lot, like how different sizes of beads work together and how tricky it can be to make something flat. It was the effort to try and turn this into something usable, and the unexpected amount of time that it took, that turned this into my project: a purple and green vineyard theme with vines and leaves with some shimmering apricots and gold. A hidden magnetic clasp serves as the closure for the necklace. This is the front of the lampwork focal bead I created for this project. 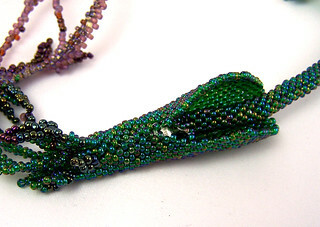 I was already more than half done with the project when I made this bead, so I knew the colors I needed, shape and size. 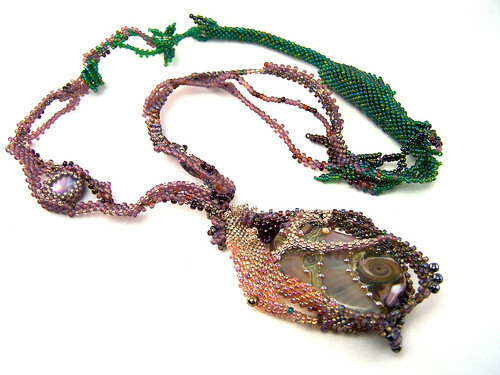 I used an organic bead design to go with the organic feel of the necklace. This is the back of the focal. I just didn't like the stitching on this side of the pendant as much as I liked it on the front. The bead itself is attached by a string of beads running through the hole in the center of the bead, loose enough that I can turn the bead in the stitching to show either side. I used some simple leaf fringe to make the transition between colors a little less jarring. I think this worked pretty well as a transition and added important detail that really cemented the theme of the necklace. Finishing the ends and adding the clasp was why I wasn't able to post the project until now. It doesn't look like much, but from two thin flat sections of peyote stitching, I knew I wanted an integrated clasp that looked like it really belonged to the project and none of it was started until this morning. Five hours later .... I guess I need to figure out how to stitch faster! Another detail view of the leaf fringe I used as a color transition. One of the few other details I included was a dyed mother of pearl bead that went with the necklace. I created a peyote bezel and stitched in between some of the vines. 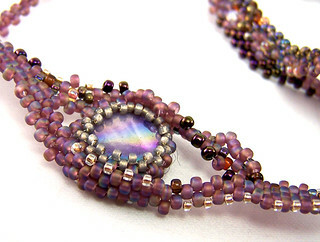 So, there it is, my first freeform peyote necklace. I like the way it turned out ... you know, for a pile of leftover beads. And I did learn a lot about the need for preplanning, the amount of time (and Fireline!) 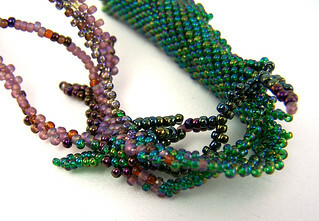 the stitching takes, and the nature of the beads and the way they work (or not) together. What do you think? What's your favorite part? What do you think it still needs? A huge thank-you to Karen and Mandi for hosting! Thank you for stopping by! I think the necklace is amazing and that focal is stunning. I love the idea for the little fringes at the color changes. Great job!!!!! Thank you! I think the fringe turned out to be my favorite part. That's so lovely, thank you! I think 'meeting' people is the best part of these challenges; finding new people to learn from and share with! I love all the elements of your design! Each one is cleverly integrated and well thought through, such as the hidden clasp. I think your transitions worked beautifully and I especially love the idea of having a reversible focal. These projects do take an inordinate amount of time to plan and fabricate, let alone sit down and blog about the results! Fabulous work!! Thank you so much for such a thoughful comment. It's nice to know I wasn't imagining how involved these projects are! Now that I've got my first project under my belt, I have your beautiful second freeform project to serve as inspiration! It's beautiful! Thanks for sharing your process. I cannot believe this was your first freeform piece!! It's absolutely glorious, and so evocative of a vineyard. I particularly like that you can see both beautiful sides of the focal. Fabulous work! Wow, Julie, well done! Very impressive for a first freefrm project. I especally love the way you transitioned between colors and ow you handled the focal - it merges with and enhances the glass beautifully. Bravo! That's so nice. Thank you! It's a relief to know that the way the focal bead is displayed looks okay to others! It's hard to know, sometimes, when you're so close to the project! What an interesting structure you've created around your focal! I love the color gradation, too :) Gorgeous work. Your piece is absolutely gorgeous. I love the way you beaded around the focal and encased it so gently and artistically. And how you got the magnets into the piece so organically. Fab work!!! Thank you SO much! I've always admired pieces with hidden clasps, so I was happy that my effort worked as well as it did. This is absolutely beautiful and I cannot believe it was your first effort. Wow you knocked this out of the park! Love all the detail work, colors transitioning and that focal is to die for. The way you carefully present it inside the lovely stitched areas is wonderful. Thank you for the lovely compliment, Katherine! I did try to be deliberate about where I stitched in front and back of the focal, so I'm glad it shows! Wow! This is so beautiful and has a wonderful organic feel to it. The colors are fabulous and it seems to flow effortlessly. Thank you so much, Christine! It's so hard to go wrong with rich, earthy colors! Beautiful, It reminds me flower in the rain forest, very good idea with hidden clasp,I love it! That is a lovely comparison! I hadn't thought of it that way, but it's a beautiful way to think of it! Thank you so much! 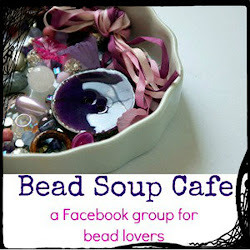 Love your focal bead, very good for first freeform, great job! Outstanding design, Julie! 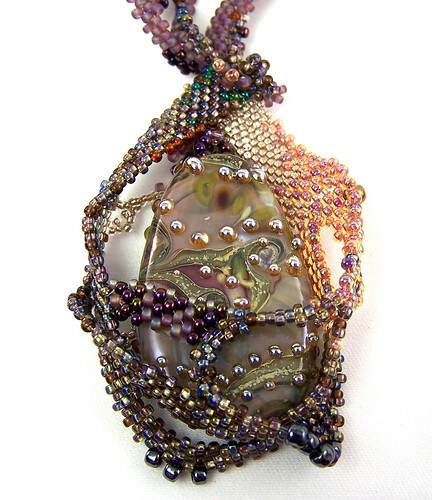 The focal bead is so beautifully embraced by the freeform netting! And the whole necklace looks like some kind of exotic plant. Your FIRST freeform???? *Hangs head in shame* I so wish my first was this gorgeous! There are so many things I love about it, most especially the way you surrounded that beautiful focal. Well Done!!! Awww, Shirley. That's so sweet. To be fair, I'm not new to beadwork, but fringe on a piece I made from a pattern is the most daring I've been before. Thank you so much for your wonderful compliment! 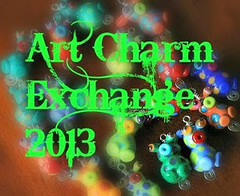 I love the colors, and I'm impressed that you made the gorgeous focal bead. Most of all, I love that you included tubular peyote. I would never have thought of that! wow, a stunning piece, just sstunning. 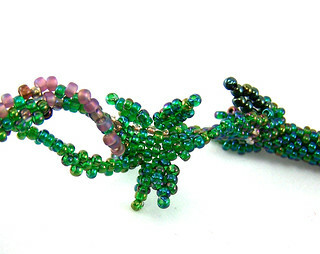 I love the bead you made for this piece and the very clever method of closing it. I love everything about this piece. That is beyond sweet, thank you, Jane! I stole the hidden magnetic closure idea from others ... if only I could remember who! It is such a great idea! 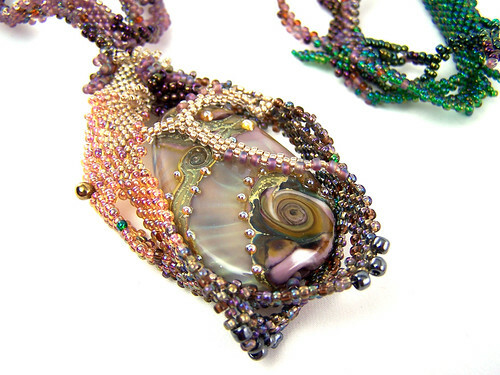 Your necklace is a fantasy land of wonderful eye catching delights. 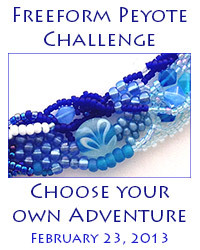 The focal bead you chose is perfect for this necklace. Beautiful! Lol. Thank you so much for the delightful compliment! Love your necklace, the colors, design, very stunning work! Thank you so much, Judy! My philosophy is definitely - when in doubt, let nature be your guide! Julie, it is beautful! You ceated a fantastic necklace.